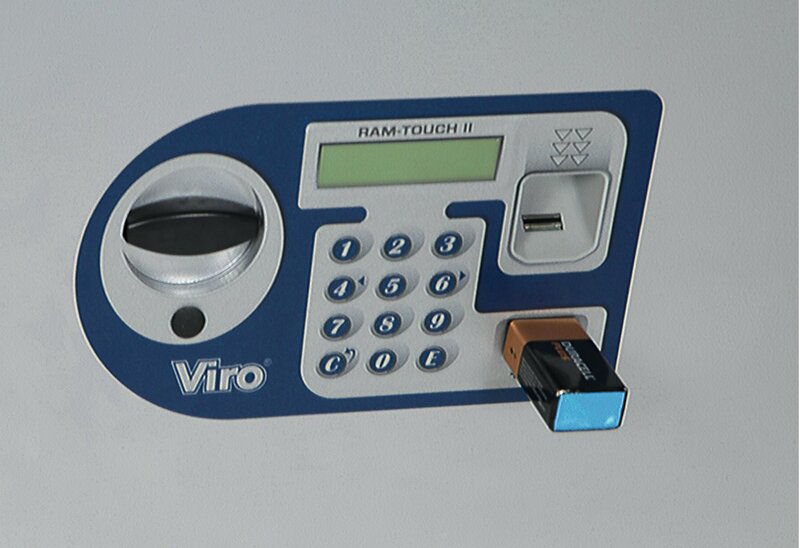 In the previous blog we saw some of the features which distinguish the new range of Viro Ram Touch II safes, the main one being the capacitive keypad. However, the Viro Ram Touch II has many advanced features. What happens if a thief forces me to open the safe with threats? It is possible to activate the “Silent Alarm” option. This means it is possible to connect the electronic card of the safe to an alarm with a telephone dialer connected to the police or to a monitoring service. 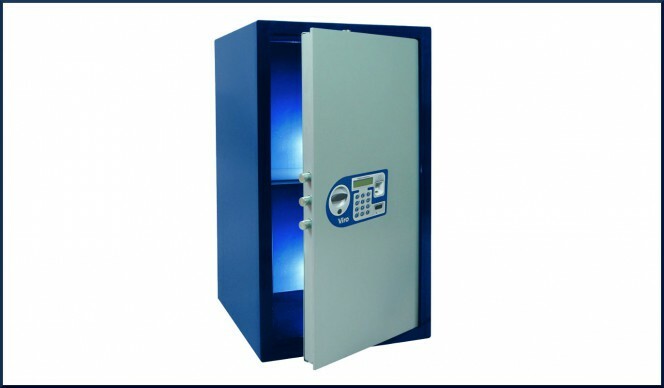 This real-time alert is triggered only when the safe is opened with a specific fingerprint or a particular code, previously associated with the silent alarm. In the (unfortunate!) case we were forced to open the safe under duress, we could use the code associated with the silent alarm, without making the thief suspicious, who, hopefully, would find the police waiting for him right outside the building. 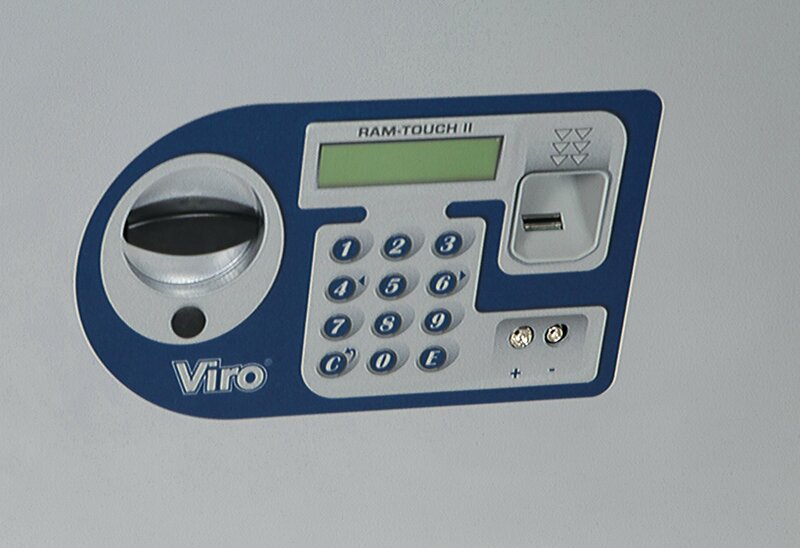 Display and capacitive keypad of the new Viro Ram Touch II safe. And if someone tries to open my safe by force or by trial and error? There are two systems in place to prevent undesired access: the vibration alarm and the automatic electronic lock. The door is equipped with a vibration sensor which, if the electronic card is connected to an external anti-theft system (siren or a telephone dialer), is able to trip it in the case of a brute force attack. On the other hand, to prevent a thief trying to guess the code, there is the automatic electronic lock, which is activated after 5 consecutive errors and has a duration of 15 minutes, during which time the safe cannot be used, except with a mechanical emergency key. The possibility of this happening without realising it is unlikely; let’s see why. The system uses a low consumption technology which extends the maximum life of the batteries and acoustic and visual signals also warn well in advance that the batteries need replacing. If, however, the batteries are completely flat before they are replaced, the non-volatile memory fitted to the system is designed to retain in the menus all the codes, fingerprints and settings. In this case it is always possible to open the safe with the mechanical emergency key with a profile can not be duplicated, or you can use the appropriate contacts on the door to connect to a 9V battery, which transmits enough power to the system to swipe a fingerprint or enter a code and then open the safe. 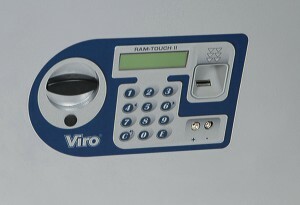 9V battery inserted in the door of Viro Ram Touch II safe. Inside temperature and humidity levels are shown on the display. A further advantage is offered by the possibility to fit a humidity alarm, which promptly signals the possible formation of condensation, so as to prevent oxidation of jewellery, watches or weapons, contained in the safe. Finally, the chosen construction materials provide quality, reliability and security; in fact, the thicknesses of the steel used (frame 12 mm and door 10 mm) withstand brute force attacks, whilst the manganese, protecting the electronics, provides effective anti-drill protection. 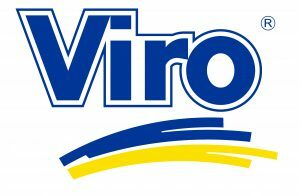 Thanks to the new capacitive keypad, Viro Ram Touch II combines ease of use and innovative features to provide the right balance between technology and mechanical protection. The result is a truly integrated security system, which is able to satisfy practically any requirement. This entry was posted in Safes and tagged products, technology, tips on 3 May 2016 by calessandrini. I definitely loving every small bit of it I have you bookmarked to check out new material you post.